I have another Julep Welcome Box for new Mavens to try out! This one is made for September birthdays with a special September birthstone polish! This welcome box is a great way to start your monthly Julep subscription box! If you want to see my most recent Julep box, click here. For only the $2.99 cost of shipping, you will get this 4-Piece box with three polishes and an Eye Glider! Get your subscription started by clicking here and use code HAPPY or look below for more details on what a Maven Subscription is. Photo is representative of the products included, however actual colors may vary based on stock availability. 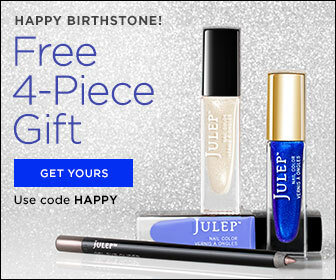 By joining Julep, you get a monthly nail polish and beauty subscription that's fully customizable. Every month is skippable (after your first box) or you get $40+ of merchandise for only $24.99. You can also sign up for a three month pre-paid subscription and get your boxes at only $19.99 per month (plus FREE SHIPPING on this Welcome Box). All month long, you get your 20% off discount and free shipping on all orders! Let me know if you sign up for this, I love seeing pictures of everyone's welcome boxes!